Our Guys with our club flag. (Most of) 3rd Platoon with the club flag. 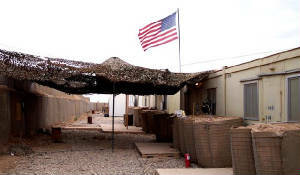 The platoon flew our club flag over the FOB in Iraq. It is currently on the way "home" and will be framed and hung in the clubhouse next to this photo. Getting a complete group photo is difficult and probably impossible because some of the guys are always on leave or other assignments. This one is only missing a couple or three of the guys, but also all three of the new guys who arrived after it was taken. 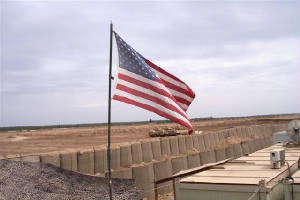 The flag flying at the FOB in Nathan's "yard". 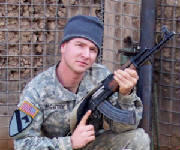 *Thanks to SPC MacVittie for these pictures. View of the countryside from the FOB.